They came tossed in either a maple sriracha sauce or house BBQ. As much as I love BBQ, I have a hard time turning down a mix of sweet and spicy flavors like maple and sriracha (while recognizing that, of course, there are BBQ sauces that are both sweet and spicy, sheesh). Like a good human, I went with the blue cheese dip instead of ranch and even though I saw there was celery, I let it fly because I thought someone I was eating with might enjoy it. Plus, celery on the side of a dish is never nearly as harmful as several other veggies. The wings had a glisten to them that intimated that they were a lot more maple than sriracha, but I let my mouth be the judge of that. It turned out that while there was plenty of sweetness to the wings, this was balanced out by the spiciness of the sriracha, while the blue cheese dressing added a sour taste that melded well with the wings. The wings themselves had a nice crispiness on the outer edge to go along with the tender, juicy meat inside. All I really could have asked for was more meat on the bones, and perhaps just a classic wing sauce. 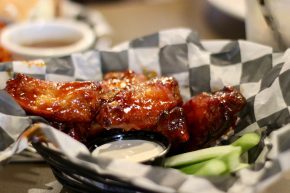 Regardless, these wings delivered, continuing to prove that it is still tough to go wrong with bar food.